RABBI MEIR BAAL HANEIS - as his legacy to all generations - vowed to personally intercede in Heaven on behalf of any person, in crisis or distress, who gave charity to the poor in Israel in his memory. The The RABBI MEIR BAAL HANEIS SALANT CHARITY is one of the oldest and most respected charity organizations in Israel. This sacred charity organization was founded in 1860 by the saintly Chief Rabbi of Jerusalem for seventy years RABBI SHMUEL SALANT (1816-1909), and his great father-in-law the saintly RABBI YOSEF ZUNDEL SALANT (1786-1866). These two great sages were the leaders of the renewed Ashkenazi settlement in Jerusalem which began with the students of the Vilna Gaon, Rabbi Eliyahu in the late eighteenth and early nineteenth centuries. . When Rabbis Yosef Zundel and Shmuel Salant came to the Holy Land in 1839-1840, it was a time of extreme hardship and poverty. A tremendous influx of Jewish families from all over the world had already begun, men and women taking a tremendous leap of faith to leave their respective homelands and families to settle in the Holy Land, which was a barren country at that time. Without having a stable organized financial base for its existence, the destitute communities in Israel began an unprecedented descent into abject poverty, the likes which it had not seen in decades. Hundreds of people, particularly infants and young children, died of illness brought on by malnutrition, hunger, and lack of adequate sanitary conditions. The dire situation threatened to engulf the entire country and put an end to Jewish survival there. Rabbis Shmuel and Zundel Salant, leaders of the community, rose to this monumental challenge. 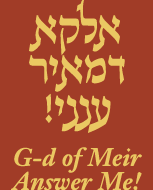 With the cooperation of rabbinical leaderships around the world, and the Lehren family of Amsterdam who were in charge of the collection and distribution of charity funds to the various communities in Palestine, they founded the â€˜Central Committeeâ€™ and the Rabbi Meir Baal Haneis charity fund. This new organization brought order, transparency, and even-handedness to the country, and provided support and succor for all Israel's impoverished families, and literally save them from oblivion. The â€˜Central Committeeâ€™ and the Rabbi Meir Baal Haneis charity fund successfully united the entire country under its umbrella. Rabbis Zundel and Shmuel Salant, in their great wisdom incorporated many beneficial regulations and ordinances, which provided fairness and equality to all the various factions within the community. This new charity entity was hailed as a â€˜lifesaverâ€™ and all the leading rabbis and lay leaders of Israel and the Diaspora enthusiastically endorsed and supported it. Rabbi Zundel and Rabbi Shmuel worked together tirelessly and selflessly for the benefit of the community. 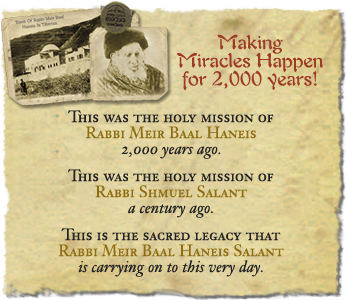 The Rabbi Meir Baal Haneis charity became the foundation of support for the entire community at large, and saved it from sinking into financial abyss. Unfortunately, Rabbi Zundel lived for only a few short years after its establishment. During the final years of his life he devoted himself wholly to bring this monumental undertaking to its peak realization. In 1866 there was a terrible outbreak of the plague. Rabbi Zundel, tirelessly and selflessly, tended to the people who were dying until he himself became a victim. Upon his passing, the Rabbi Meir Baal Haneis charity had already become the lifeline for hundreds of the country's poorest and most destitute families. Rabbi Shmuel Salant continued to devote his life for the benefit of Jews in the Holy Land. Before he passed away in 1909 he pledged that anyone who supported this holy fund will merit heavenly blessings and Divine mercy. The remarkable power of this miracle working charity, which champions the cause of the poor and forgotten, the sick and impoverished, the widows and orphans, and victims of unfortunate circumstance, is vibrantly potent until this very day. Countless stories abound of men and women, who during a time of crisis or need, experienced miraculous help when they gave charity to this unique and holy fund! Surely you too can use an extra blessing in your life! Support the poor of Israel through Rabbi Meir Baal Haneis. In this merit you will bring tremendous blessings of good health and prosperity into your life.